I’ll be Showing and selling my work at the fantastic Designers’ and Makers’ Fair at Eastbourne’s iconic Towner Gallery. There will be 55 exhibitors showcasing a range of printmaking, artist’s books, 20th Century design, ceramics and contemporary crafts. This is an exciting opportunity to see contemporary makers showcasing their latest work in one of Britain’s leading galleries. The second hall will be for established print makers, mid-century prints and ephemera, fine press ‘artists’ books, patterned paper, and those artists and publishers who are influenced by the 20th Century artists whose work is celebrated within the Towner collection. Accompanying the Fair will be a series of engaging talks and tours of the Towner. Hear the UK’s leading illustrators, gallery owners and art historians discuss their research and it’s relevance to The Towner’s collection. 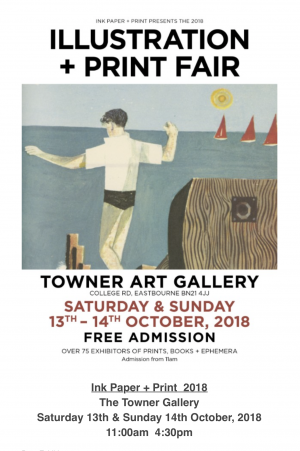 There will also be opportunities for ‘behind the scenes’ tours of the Towner’s archive and its unique collection of 20th Century British Art. Tickets are available for purchase here.